Multiple DUI enforcement initiatives across the state of Maryland this past weekend led to the arrests of more than 70 impaired drivers, including more than one dozen arrested by troopers with the full-time impaired driving enforcement team who marked their 2,000th arrest. Five of those drivers were arrested at a sobriety checkpoint near Joppa. The State Police Impaired Driving Reduction Effort, or SPIDRE Team, a specialized unit of troopers who work high DUI areas, made 16 arrests for impaired during three nights of weekend patrol. Two SPIDRE Team troopers each made three DUI arrests Saturday night alone. Of those arrested who took the breath test, the average blood alcohol content registered was .14. Twenty-five percent of those arrested were repeat offenders. The team worked in the Langley Park area in Prince George’s County, where data show a high concentration of DUI/impaired driving crashes. The SPIDRE Team was launched in May 2013. During their latest patrol, the team made their 2,000th impaired driving arrest since inception, ending the weekend with 2,004 total arrests. The SPIDRE Team is funded through a grant from the Maryland Department of Transportation Highway Safety Office. Elsewhere in the state, troopers arrested 61 impaired drivers while conducting patrols and a variety of DUI enforcement initiatives, often working in coordination with local law enforcement. 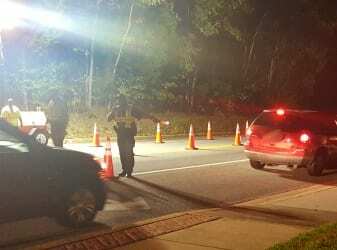 Five impaired drivers were arrested at a sobriety checkpoint near Joppa conducted by troopers and deputies from the Harford County Sheriff’s Office. Troopers at the La Plata Barrack conducted a checkpoint with officers from the La Plata Police Department, as well as a saturation patrol. Other checkpoints or saturations patrols were conducted by troopers in Allegany, Worcester, Wicomico, and Prince George’s counties. Outstanding assistance is provided to troopers from State Highway Administration personnel, who assist with lighting, signs and traffic control at sobriety checkpoints.